A two hundred eleven pages account on the culture of bygone days Shahjahanabad, author memoirs, & an encyclopedic collection of diverse recipes. The title “Jasmine & Jinns” came up from author’s childhood memories of her ancestral “Shama Kothi” at Sardar Patel Marg where both Jasmine Shrubs & Jinns shared the space in the capacious villa. The rich illustrations from food to monuments add the visual aura to the text. Starting with the first portrait of the author by blogger & columnist Mayank Austen Soofi, the manuscript adds a visual journey by photographs of Delhi’s Monuments, street food, culinary dishes & portraits of her family. The book commenced with the evolution of Delhi’s cuisine tracing its history from Turks, Mughals, British & finally the arrival of Punjabis after 1947. Then it discussed the sociocultural history of the Muslim Khatri tribe (Saudagran) who made Shahjahanabad as their home during the days of Mughal emperor, Shahjahan. During childhood, I had heard a legendary story of Hazrat Shamsuddin Sabswari who brought Ganga for the Khatri caravan on the way to Haridwar from one of the father’s Punjabi (Shamsi) friend at hometown, Pilibhit. Majority of the Muslim Punjabi (Shamsi) community in small towns of western Uttarpradesh traced their origin from Punjabi Saudagran tribe of Shahjahanabad. Then in 2003, I read an article that came up in Hindu by columnist Vivek Shukla providing the glimpses of the history & the culture of Saudagran community. Sadia Dehalvi as a member of Old Delhi Punjabi gharana provided an in-depth narrative on culture & history of Punjabi Saudagran community. Back in Punjab, Pakistan, the Saraiki & Punjabi speaking Muslim Khatri’s were popular as Chinioti’s due to their ancestral affiliation with Chiniot. The chapter mystique of Shahjahanabad portrayed the vibrant culture & rich cuisine of the walled city starting with bygone days Urdu proverbs called out by street vendors like “ Lakad Hazam, Pathar Hazam/digest wood & stone” recited by traditional digestive tablet sellers. Hafiz Yusuf Dehalvi, the patriarch & founder of “Shama Magazine” brought the culture & cuisine of walled city from Haveli Habsh Khan to 11, Sardar Patel Marg. The traditional kitchen lined by Pindol in the lavish modern villa was designed by Sadia’s grandfather, Hafiz Yusuf Dehalvi to accommodate his generous hospitality. His values were drawn on his belief of “Fi Sabilillah/For the sake of God” & Prophetic saying “The best among you are those who feed other”. A lady from Baghpat who wore a tent-shaped veil (Afghani Abaya) became a foster mother for author & her siblings. From storytelling to food cooking, she is the one who has a significant role in nurturing the hobbies of Sadia Dehalvi. With expanding urban sprawls & disappearing of traditional Taaqs, the Jinns of Delhi & their stories absconded from the homes of Delhi. Reading the chapters “Halal World” & “early lesson” is a nostalgic recall of the lost time & values from traditional Muslim upbringing. The term “ Niaz/ Food offering” reverberate the eardrums as it has been lost somewhere in the changing face of Islam. The lost values of Niaz were connected with Islamic roots by an introductory picture from Hazrat Nizamuddin dargah Iftar & a Hadith of Prophet ( Peace be Upon him) on feeding. From real herbs & spices, the culinary section of the book moved from all-time favourites to the seasonal dishes & finally concluded at Ramzan & Eid. The gustatory delights presented by the author supplemented with the portraits of her home cooked dishes will give a pleasurable journey to the readers. “Some of all time favourites” discussed a wide variety of traditional dishes. From a Yakhani Pulao with Arqe Nana chutney to Shab Deg ( made up of Carrots, mutton pieces & Kofta), the chapter brought a diverse variety of traditional dishes. As mentioned by Author, the Nargisi Kofta enriched the dastarkhwan (tablecloth) on special occasions, a tradition common with Delhi Wallas was also prevalent in small towns of Western Uttar Pradesh. The traditional medicine (Unani) classifications of the food in taseers (effects/efficacy) like garam (hot) & dhandi (cold) divided the cuisine in alignment with seasons. The winter’s cuisine was introduced with Nihari, the pride of Delhiwallas. Once in Saudi, I received a parcel of Nihari cooked by the colleague mother in Karachi. The Nihari has an odour & taste specific of Shahjahanabad. On the food, I came to know that his ancestors belonged to Punjabi saudagran community of walled who migrated to Karachi during 1947. The delicacies of walled city & Punajbis was well preserved by his mother as the first generation of Delhi wallas in Karachi. The summers in the book were greeted by a bygone days beverages (Sherbet) of Bel (Woodapple), Falsa, Sandal, Unab (Jujube), Gauzaban & fruits of the walled city (Shahtoot, Khirni, & Kaseru). This section discussed the amalgamation of diverse veggies with mutton. The recipes from flower buds (Kachnar) to bitter gourd stuffed with minced mutton (Qeema bhare Karele) with traditional desserts aam pulao (Mango rice) to Aannaas Pulao (Pineapple rice) will amaze the readers. The open spaces of the Mehrauli made it a favourite destination of forgotten Mughals especially the last one Zafar adored it during monsoon. The tradition continued in the walled city & author’s recalled her father visit using camel carriages from Lahori gate to Mehrauli. Pakoras with tea, pre-partition old Delhi wagons, & trams & story of a mango that travelled from “Rataul, United Province” to Punjab, Pakistan captivated the lost time of Delhi. Now after seven decades, the Ratual became the pride of the orchards of Punjab, Pakistan. The India, & Pakistan both are debating on the origin of the famous mango. Kachalo (Fruit Chaat) was an essential of Ramzan Iftar what I recalled from the childhood days from my mofussil hometown located in the Terai plains of Himalayas. A variety of dishes prepared by vegetables & Gosht (Mutton) has been introduced here. In old days, this was the traditional Muslim style of adding veggies to their diet. The substitute of Haleem is the grainy version of lentils with meat pieces identified as Khicda in UP. Across the border on another side, the Haleem of both Lahore & Karachi is closer to Delhi walla style. The Eid celebrations didn’t change much with time except “Eid Al Azha” has transited to “Eid Al Adha” with Arabization of Urdu in the present context. Even in these days, the long list of the feast preparation started with “Kalegi/Liver“. The usage of the verbatim traditional Urdu terms such as Ghotni (wooden Laddle), Salan (curries), tukhme rehan (basil seeds), tabaruk ( blessed), & baadi (difficult to digest) enriches the context for the local readers. 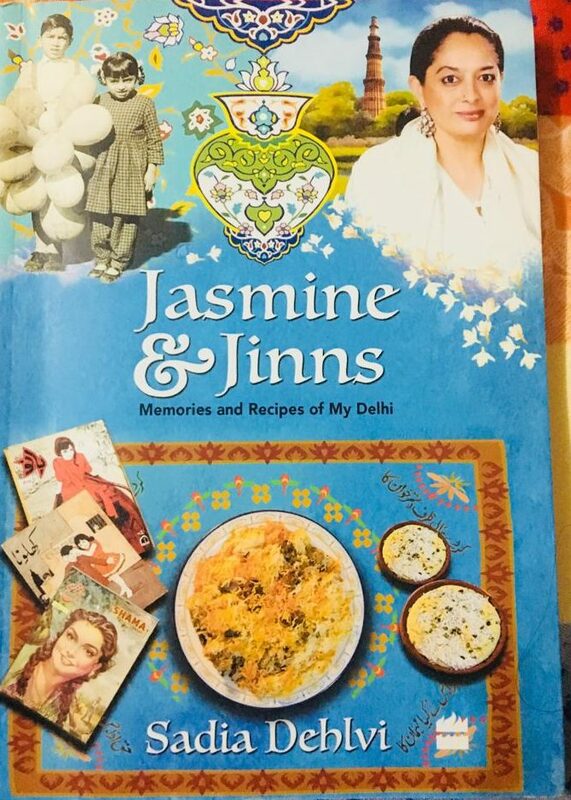 The Jasmine & Jinns is not only about the recipes of the diverse cuisine, but it’s also about the context, traditional utensils, season & occasions that were reflected in depth by Sadia’s preparations. A must-read account for all those who are in love with food & culture of Delhi especially Shahjahanabad. Vivek Shukla, Death no leveller in Capital cemetery, The Hindu, 06th March 2003. Retrieved from: https://www.thehindu.com/thehindu/mp/2003/03/06/stories/2003030600560300.htm? 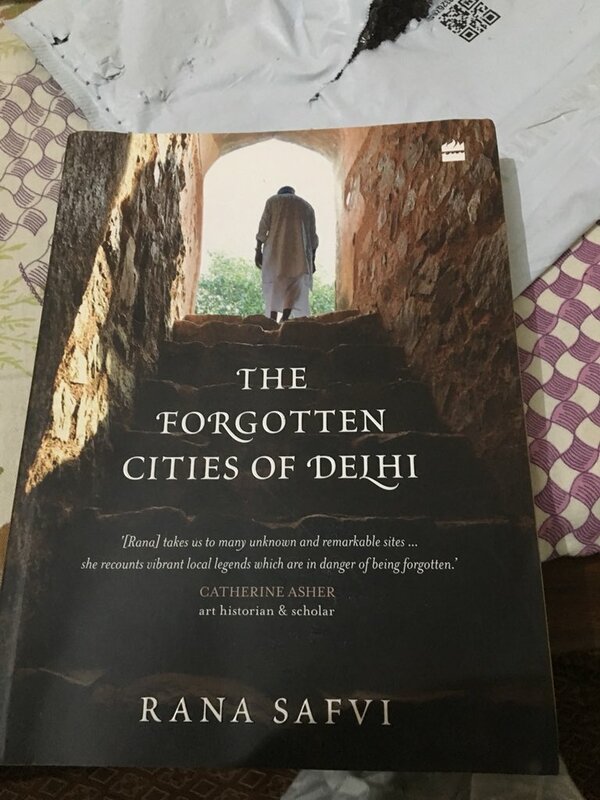 “The Forgotten Cities Of Delhi” a treatise by a noted author & historian Rana Safvi, photographs by Syed Mohammad Qasim, and publication by HarperCollins India was launched at Amazon on 04 May/2018. I was among one of the early readers who booked it on the same day. The beautiful front cover has an endorsement of art historian Catherine Asher & abstract on the flap commenced with the lovely couplet of Mir Taqi Mir cited above. Chapter one started with the title “Siri” covering twenty-four known & unknown monuments located in the premises of Sultan Alauddin Khilji late thirteenth and early fourteenth-century capital built to defend it from Mongols. Every section within the chapter started with the name of the monument, its picture and contextual poetic verse of Urdu/Hindustani & Persian with its English translation. 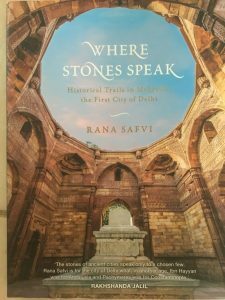 With an architectural description, the text includes the succinct historical accounts, narratives from locals and descriptive citations from nineteenth-century sources “Asar Us Sanadid “& “Archeology and Monumental remains of Delhi”. More or less the similar pattern was followed for all the subsequent chapters in the book. From seventh century Suraj Kund up to the nineteenth century Mirza Ghalib tomb, the manuscript covered a diverse range of monuments located in the five cities of Delhi that came up after Mehrauli. A book two in the trilogy of “Where Stone Speaks“., it’s an outcome of hard work, research, exploration and passionate Journey of more than two years in form of historical trails conducted by author & fellow photographer. In the recent talk with Indian express, while telling tales of Sufi Saint Hazrat Nizamuddin & Sultan Ghyasuddin Tughlaq Shah at Tughlaqabad, she recalled her journey for the exploration of one hundred sixty-six monuments depicted in the account. I had a great time with the Indian Express team as story telling that too in ruins is my passion. A book excerpt articulating mysteries and stories on the resting place of the 18th-century Persian poet and Sufi Saint Abdul Qadir Bedil published by the @iamrana in @DailyO_. 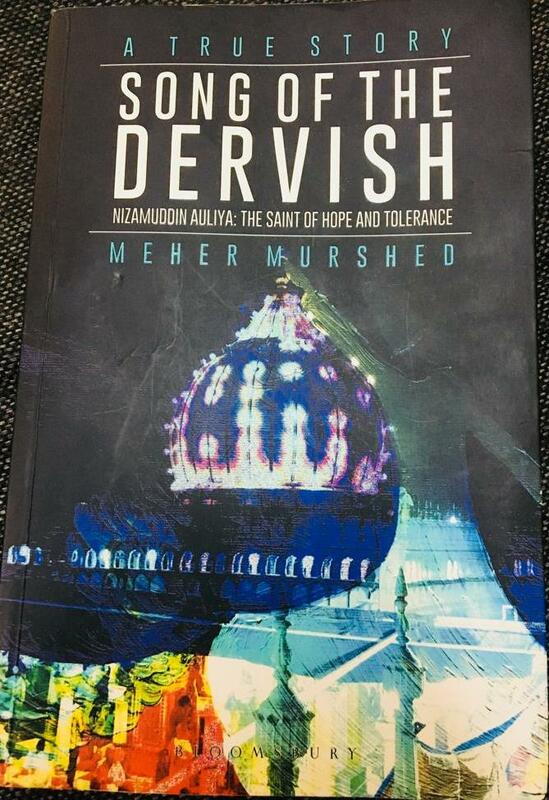 Similarly, in one of the chapters, the author marked a location as “Mehdiyan” on the site of Maulana Azad Medical College where a fourteenth-century Nawab built an iconic structure to commemorate “Urs” of the Saint of Baghdad, Shiekh Abdul Qadir Gilani. In a similar manner, many unknown monuments and the stories built around it has been recollected in the book. The last chapter historical trails are the great addon to the book. Its a reflective account of fifteen historical walks in a concise manner depicting the monuments in relation with important landmarks. It will serve as a guidebook for anyone who wants to reach the monuments described in the book. In the changing landscape of growing Delhi, the author also reflected the plight of many monuments ruined by encroachment, illegal human settlements and ignorance of civic authorities. Other than interested readers, the accounts in the book can be used as one reference for the bodies volunteering the monumental protection in addition to ASI. The serene and awesome pictures by Syed Mohammad Qasim (@EvolveLeadLove) gave an enlightenment from the visual perspective to the readers. Short accounts within the sections of the chapters, easy language, and integration of stories made it more interesting while the usage of standard oriental and English reference reflected its scholarly rigor. The Full Circle Bookstore, Cafe Turtle, and Harper Collins India organized a book launch for “The Forgotten Cities of Delhi” at Greater Kailash I, New Delhi on 22 June. I would like to deliver heartiest congratulations and thanks to Rana Safvi and Syed Mohammad Qasim for the great compilation and upcoming launch. Note: The translation of Mir Taqi Mir cited above is taken from the account of Rana Safvi “The Forgotten Cities of Delhi“. The book “Chandni Chowk” was published by Speaking Tiger Publishing Pvt Limited in collaboration with YES Institute in 2017. The “Walled City/Old Delhi” located in the present urban landscape of National capital region was once a dream project of a monarch to establish it as a new capital for mighty Mughal empire. The oriental accounts referred the term “Old Delhi” for the thirteenth century Mamluk capital Mehrauli, the first city of Delhi. Before the establishment Luytens Delhi, the walled city of Shahjahanabad has a privilege of the term “New Delhi” associated with it. The authors Swapna Liddle treatise on Mughal city of “Shahjahanabad” is a fascinating account articulating its formation, culture, rise & fall integrated with the history of its political transition & turmoil down the centuries. 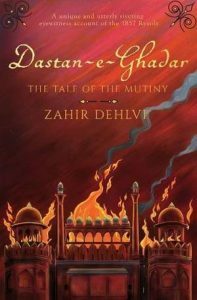 The book started with the story of its birth under Shahjahan, passing over to the puritan Aurangzeb, vulnerable days under forgotten Mughals, its cultural zenith, devastation during the mutiny, post-mutiny transition and its acclimatization with the twentieth century. The rich scholarly content with fine contextual details reflected in the manuscript is reflection of authors doctorate on eighteenth-century Delhi & her great experience of conducting heritage walks in Shahjahanabad. The description of the key events by citing accounts of the contemporaries such as narrations of Bernier and Mannuci in chapter one & two gave the reader an alluring engagement during the journey of exploring the book. The references were cited in the text as superscript in a continuous manner with the diverse range of references presented as notes at the end of the manuscript. This style facilitates the flow of the reading while maintaining the scholarly practice of in-text citation. Embedding heart-rending verses and their translation of contemporary poets like Sauda and Mir provided the readers to explore the plight faced by the citizens of Shahjahanabad during the days of turmoil. The creativity lies in outlining every sociocultural and religious transition of the nineteenth century in a succinct manner. For example, in a concise way schism created between grandson of Shah Waliullah Dehalvi and all the other traditional scholars of Zafar’s Delhi over basic beliefs of Islam were elaborated. It was the newly evolved puritan ideologues from the deserts of central Arabia imbibed by Ismail Dehalvi. All the great scholars of Delhi including Sadaruddin Azurda and Maulana Munawwaruddin, the maternal grandfather of Azad rejected it and they came to refute Ismail in a long debate held at Jama Masjid by Maulana Fazle Haqq in 1831. The chapter “The East India Company’s administration” also depicted vivid description of the cultural, and educational renaissance going on in 19th century Delhi. The chapter “The Revolt and Aftermath” is an account presenting the plight of Shahjahanabad and its citizen under the hands of mutineers and then by British forces after 14 September 1857. How the social order has been uprooted in the midst of the chaos and massacre, the author cited the heart-wrenched verses of “Zahur”. The last part of the same chapter articulated the response, growth and modifications happened in the plan of the Shahjahanabad during post-1857 era. The second last chapter sketched the transition happened in the city from Mughal capital to the British capital. The author focused on the modern infrastructural changes, upcoming civic bodies, coronation durbar, political winds of twentieth-century Delhi and demographic shift with the mass movement of immigrants from the newly created state of Pakistan. The book ended with the last chapter titled “Shahjahanabad Today”. This chapter is a wonderful connection of present vibrant, encroached and overcrowded “Purani Dilli” with its glorious past. The Chandni Chowk though no more left with a pool reflecting the moonlight but its eateries, culture, shops and worship places have the lot to offer for the visitors. The origin of the localities with its translated names like Katras (Commercial enclaves) and Kuchas ( lanes) is helpful for the English readers. The addition of nineteenth-century paintings with each chapter add the rich visual perspective to the text. 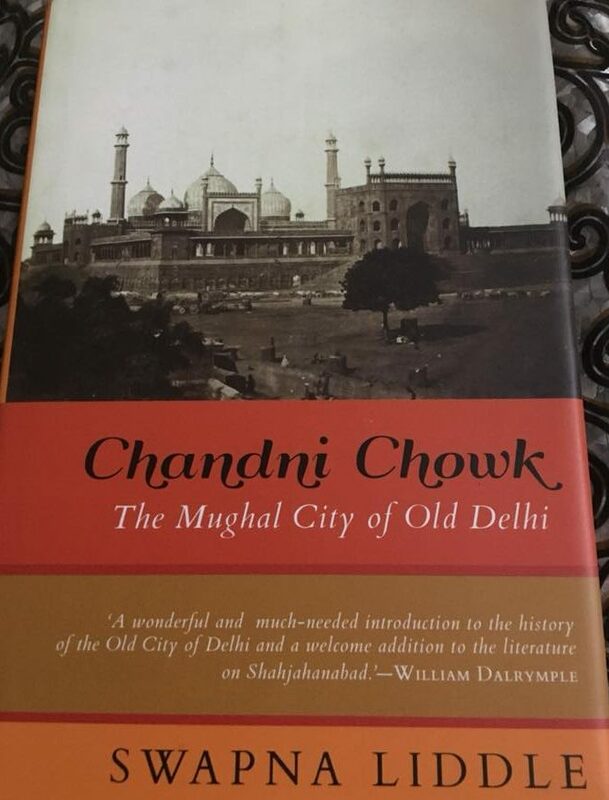 For me as a reader, the “Chandni Chowk: The Mughal City of Delhi” is a fascinating journey that also provided much insightful learning on the title. Its an account talking on culture, society, ethnic composition, literary & political environment intermingled with the historical timeline of Shahjahanabad from its birth up to present days. Swapna Liddle account will provide you a wonderful journey to the days mesmerized by the 18th-century poet, Mir Taqi Mir. Note: The English translation of the poetic verses has been taken from authors account. The book titled “Remnants of a Separation” authored by Aanchal Malhotra and published by Harper Collins was released on 15/August/2017 at the completion of seventy years of Indian partition (Batwara). In last seventy years, the numerous books have been published on the event that created more than fourteen million homeless population and estimated death of approximately two million human souls. As born in Western Uttar Pradesh, I was brought up listening stories of partition from grandparents. The region was the part of United Provinces of Oudh and Agra in Colonial India that has the considerable support of league among the Muslims agrarian landowners. Some members of the Grandparents extended families had chosen the strange land on the other side of Radcliffe line. It was the illusion of chosen land created by the Jinnah among the elites landlords of United Province & Oudh that compelled them to leave their homelands. I had an opportunity during childhood days to interact with relatives from Karachi visiting their ancestor’s homeland far off in Uttarpradesh. During the Senior Secondary days in 1997, I had come across with my first non-fiction read up on partition “Freedom at Mid Night by Lary Collins & Dominique Lapierre (1975)” almost twenty years from now. Almost at same time, I was blessed to read the great Kushwant Singh masterpiece, “Train to Pakistan“, a fiction centered around the syncretic love story of Punjab in the backdrop of communal violence. From then onward, I tried to explore the context of partition by reading manuscripts and research articles as an inquisitive reader to explore it. As the topic filled with multiple historical reviews, & viewpoints, it seems to be contextual for third generation Indian and Pakistanis like me. 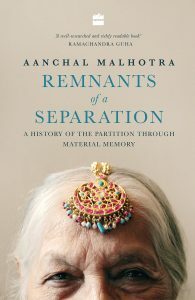 During last month I got an opportunity to read the “Remnants of a separation: A history of the partition through material memory,” a book released on the eve of seventy years of Indian partition. The idea behind the book was commenced with the effort of a young researcher of Fine Arts who had chosen the stories moving around the artifacts and materials related to the context of Indian partition as the dissertation of her MFA (Masters in fine arts) programme at Concordia University, Montreal, Canada. The author reflected in the introductory section, the significance of material memory crept in 2013 when the photojournalist and columnist Mayank Austen Soofi widely popular as Delhi Walla was exploring Vij Bhawan for his column. It was the gaz (feet) and ghara (metallic vessel), a pre-partitioned legacy of the Vij (Authors maternal grandparents) that appeared as prime stimuli of the research idea. The creativity lies in the author’s sense of integrating valuable artifacts (storehouse of the memories) carried by the immigrants on both sides of the Radcliffe lines during partition. The qualitative research is a standardized model for exploring anthropological and ethnographic context. Oral history collected by conducting in-depth interviews and artifacts used in congruence are tools of the qualitative research that has been used in this project. The titles of all nineteen chapter are connecting the link to memories and each of the chapters is meticulously selected case reflecting unique ethnic and social context about the event of the partition. Ingenuity lies in the exploration of beautiful memories by connecting with the tactile stimuli of materials and belongings of the past. Most of these memories were buried in the deep subconscious of these individuals behind the denial of the traumatic events that happened seventy years before. Other than citing standard references, and archives on Indian partition, the author embed herself as an explorative researcher to perceive the emotional context extracted from each interview. It gave us the deeper understanding of the geographical origins especially for the group of the population who left their native land under arduous circumstances. Each context presented in the book as chapters moved around the artifacts, heirlooms, objects as the connection with memories also provide the readers a broader historical context of the particular region/culture about the partition. I tried to reflect on some of those backgrounds that I perceived from my prerequisite understanding of Partition. The rich narratives of Vij, Malhotra’s, and Bhag gave readers an understanding of shifting the level of acceptance especially in context with Punjabi immigrants within the layered social dynamics of 1950s Delhi. All three of them belonged to Author’s family but, as an explorative researcher when she interviewed them, a unique cultural context was extracted from their past. The Vij represented a thrifty urban Punjabis from Lahore who has been established themselves as the successful entrepreneurs from centuries. It was the bloody event of “Batwara” that cut the roots of this prosperous community from the native land. The ancestors of Bahris hails from the small historic town, Qadirabad located two hundred fourteen kilometers North-West of Lahore. They represented a middle-class zamindar section of the Punjabis who undertook modern education as the tool of better survival in changing colonial India. After leaving Malakwal, the nineteen years Balraj Bahri journey on the bumpy roads from the Kingsway camp up to the successful Bahri Sons booksellers is the reflection of hard work, and rectitude. Now the Bhag Malhotra who hails from the North-West Province, a land of tribal Pashtuns. Her reflection draws a vivid picture of the life of Punjabi Zamindars in Khyber Pakhtunwala. A beautiful haveli with separate apartments for the members of extended family. The separation in the quarters and living area for females. In those days, Purdah was not confined to any particular religion. It was a tradition practiced among the high socioeconomic class of rural North Indian society. The pearls of Azra Haq represent the class of bureaucratic white-collar pre-partitioned Punjabi Muslims that unfortunately lost the ground in the chosen land of Jinnah. The “Bagh” of Hansla represented the old culture where the daughters received homemade apparel from his mother. This sacred piece of cloth passed from generation to generation carrying clemence and efforts of ancestors interwoven with memories of each generation making it a priceless treasure. Mian Faiz Rabbani represented a sample of the agrarian tribe which formed the core of Muslim league & Unionist in Punjab Province. Finishing with Shams Manzil of Mian Faiz intermingled with memories of a stone plaque, the book moved to next unique context from Punjab. It’s a story of the family belonging to Ahlul Bait (the house of Prophet) from the small town Samana in the princely state of Patiala. The sanctity of the place was due to the direct descendants of the Prophet (Peace be Upon him), Sayyad Mashaad Ali buried here long before the advent of Ghurids & Mamluks in India. Nazeer Adhami from Hardoi, (Lucknow), Oudh and his memories of Aligarh Muslim Universities gave the readers an insight on elite Muslim Zamindars of United Provinces and their participation towards the league. Parting from the memories of Nazeer from Aligarh Muslim Universty, it moved to beautiful narrations of Nizamuddin Khan, a member of a working-class Muslim family of pre-partitioned Delhi. How beautiful his descriptions of syncretic Delhi before the partition? His reflective accounts of Gandhi Ji, Nehru & Jinnah was built over the years from his father side talks who was working at Viceroy house in Lutyens Delhi. Even circumstances forced them but, somehow managed to return to the land where their ancestors were buried. Now, one of the most interesting chapters for me came up during the read up. Here I was going to read the narratives coming directly from the tongue of an Emeritus Professor of art & culture history from the University of Sussex on his legacy, partition, and reaction of his family. Transcribed and written contextually, the chapter of Partha Mitter unfolded his more than one and half century old legacy represented as a sample of elite Bengali families that was the core of India first sociocultural and intellectual movement. In other terms what is defined in textbooks as a Bengal renaissance? From the great Tipen Mitter up to Partha Mitter, the family has produced legends who perceived the winds and tides of Colonial India. The legendary journalist, Maya Mirchandi Grandmother Savitri represented a context from the ancient land from where lies the roots of the historical names “Hind” and “Indus”. The family described an educated upper-middle-class Sindhis who lost their homeland due to the voluntary exodus of Urdu speaking community from United Provinces of Agra & Oudh, Bihar, Hyderabad ( Deccan), Rajasthan & Gujrat. The Dadi Leela version of three mothers, biological mother, linguistic mother and motherland (place of birth) articulate the significance of native language and birthplace in an individual life even in unfavorable circumstances. It’s an irony that even after seven decades of partition, the Urdu speaking community that immigrated with the dream of chosen land is still struggling to be absorbed in the Sindhi population & culture on the other side. Interestingly the subgroups within this broader linguistic identity titled as Muhajir (Oriental word for refugee) were identified with the places of their origin like Delhi Wale, Hyderabadi, Bihari, Lucknow wale and further smaller units of their native lands in United Provinces. An outstanding distinctive research that explores the feelings, materials, context, and sociocultural background of the immigrants. The author’s inclusion of the verbatim transcription of the native’s words of Hindi, Urdu, Punjabi, and English extracted during interviews gave an additional uniqueness and sense of originality to the context. It’s interesting to find the shared Hindustani words like Taka, Anna, Lambardar, Khas Dan, Sarota, Deghcyian, and Hammam Dasta were commonly used in Punjab, United Provinces of Agra and Oudh, and Sindh provinces of Colonial India. I had heard these words in common usage of my grandparents and parents, but in today changing trends it seems to be archival. The presentation of the native words in their original accent, e.g., Jullundar instead of Jalandhar, Kalai (Qalai), Kabar (Qabar) as common in Punjabi accent is the reflection of applying core values of qualitative research. An Englishman, John Gregor Taylor chanting Hindi songs and missing the odor of Geeli Mitti of India, a Punjabi Arain articulating his context by an example “the demise of the sapling once uprooted from its soil” reminds me the three mothers of Leela Dadi from Mirchandani accounts. When humanity was tarnished by the savagery, you will find Hansla Chaudhry grandfather receiving the offer of Luyten Delhi mansion from his Muslim friend. Prof. Mitter father risked his own life for saving Muslims around his home at Bhowanipur, Calcutta. A Praman Matro (Identity Proof) of Sunil Kumar connecting the family with bygone days memories. There is much more to talk about but, word count binds my review. The research of the Aanchal Malhotra is an effort in a direction to touch core human values of such an important context of modern Indian history by erasing all the bias of region, religion, and culture. This unique account is an excellent add-on to the social and ethnic context of Indian partition. It will also serve as a resource for future academic researchers.